We write to pay tribute to our sister, Lois Hubbard, who passed away last week. There is so much to say about Lois’s life; decades of fighting injustice, her commitment to empowering women, the children she raised, those she taught and all she loved. But there are others who can tell those stories better than we can. So instead we want to share the few beautiful moments we got to spend with Lois, our eldest Sister. Our tribute is to show that sisterhood is powerful, it wins battles and saves lives. It’s sisterhood that brings us together and it’s through sisterhood we will remember Lois who dedicated her life to fighting injustice and for freedom from violence. In January 2016, someone got in touch via Facebook to tell us Doncaster Council were planning to shut down the only Women’s Aid left in South Yorkshire and they wanted our help. We didn’t know what we could do but a couple of us got on a train and went to find out. I met Lois in the doorway. I assumed this tiny grey-haired woman must be going to another event in the building, until I heard her energetically describe her plan to get all the older women in Doncaster to stage a ‘die-in’ on the Council steps to protest the potential closure. ‘That’ll put the wind up them a bit won’t it? !’ she said, ‘I’d like to see them try & bully a bunch of pensioners!’. I was blown away by the sheer force of her (not to mention taking an important lesson in checking my ageism!) and it was a sign of things to come. 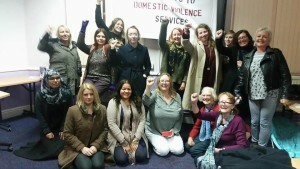 We were welcomed by a whole room full of people, who wanted us to talk about the actions we’d done at Trafalgar Square, Portsmouth and on the red carpet of Suffragette to resist cuts to domestic violence services. Most importantly they wanted to know what could be done to put pressure on Doncaster Council to fund the South Yorkshire service. They were united, ready to fight and full of ideas – in the middle of it all was Lois. In those two hours we met survivors who’d found safety at the women’s aid service and refuge workers at risk of losing their jobs. We met working-class heroes from Women Against the Pit Closures, we talked about growing islamophobia in the city, a local woman who had recently been killed by her partner, the support of unions and other groups and how men could support the fight for Women’s Aid without taking centre stage. It was an intense and important conversation, a milestone in my time in Sisters Uncut. The two of us who went to Doncaster that first day are both from working class backgrounds, and it honestly felt like magic to be surrounded by our siblings, talking in shared language about shared struggles and histories. We left the meeting high as kites…we hadn’t known what to expect but we hadn’t expected such an energy and a sense of community. We believed they could win. Starting the next week our Doncaster sisters, including Lois who was 86 at the time, took to the streets. And when I say that, I mean they took to the streets every single week for months, leafletting, shouting and raising money for their campaign. Survivors of violence, sector workers, old people, children and everyone in between were painting banners, attending meetings, petitioning local councillors and pressuring decision-makers. In a world that makes it seem impossible to fight the power of the state, the work they did was nothing short of heroic. And they bloody saved it. The saved South Yorkshire Women’s Aid. They forced the Council to continue funding them, won more from elsewhere and shouted from the rooftops that the service had to be financially secured for the long term. But one year later and sadly the service is at risk again. The onslaught of cuts and closures threatens the only Women’s Aid service in South Yorkshire again and leaves survivors with few places left to turn. 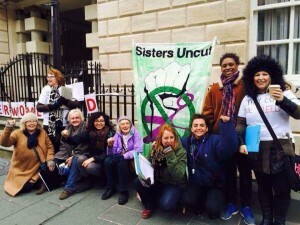 Lois was too unwell to take to the streets this time, but our Doncaster sisters have been out every week nonetheless. So our tribute to Lois is a commitment to carry on fighting as she did, to raise our voices up so high they cannot be ignored and to continue building on the legacy left to us by the powerful and dangerous working-class sisters that went before us. In sisterhood, solidarity and remembrance. Please show your support to the campaign to save South Yorkshire Women’s Aid. 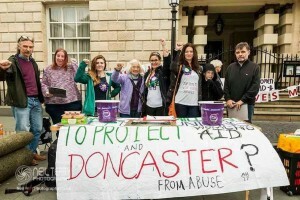 If you are able to, we’ll make sure that all donations made through the Sisters Uncut Paypal that say ‘For Lois’ in the ‘instruction to the seller’ box will be sent to our sisters in Doncaster to support their campaign.